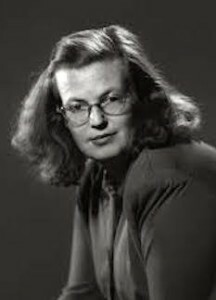 Shirley Jackson’s cheerful if messy portrayals of family life in a rambling Vermont home painted a false portrait. As she settled into middle age, she became morbidly obese, addicted to alcohol and tranquilizers, and so agoraphobic that she rarely left her house. Predating that decline was her 1940 marriage to Stanley Edgar Hyman, a literary critic and professor. Hyman was chronically unfaithful, controlling, and belittling. They met when Jackson was an undergraduate at Syracuse University. A story she wrote about suicide caught his attention, and the relationship grew from there. Both of their families disapproved of their marrying, but softened up once grandchildren came along. The couple had four children, whose antics were prettied up in her memoirs. She famously used her children as inspiration — not always flattering — in her fiction and nonfiction. Life Among the Savages and Raising Demons were early “momoirs” that inspired the likes of Jean Kerr and Erma Bombeck. The Hyman-Jackson family life wasn’t quite as fun as the glossy, funny portraits she painted in her pages. Hyman was a respected figure in the literary community, even as he was widely considered arrogant and combative. 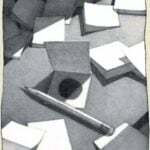 With his wife, he was nothing short of a tyrannical bully, going so far as putting her on a strict writing schedule. In some ways, though, she benefitted from the rigor he enforced and his literary connections. He even bought a dishwasher with her royalties so she’d have more time to write! Still, “The Lottery” soon became a staple in high school English curricula and is one of the most anthologized short stories of twentieth-century American literature. 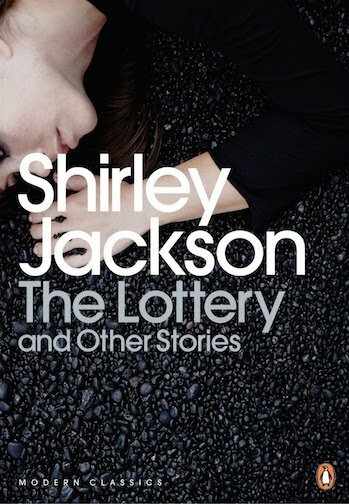 The Lottery and Other Stories was Jackson’s first collection, published in 1949. After “The Lottery” put her on the literary map, her output continued at a fast clip. That same year, 1948, saw the publication of her first novel, The Road Through the Wall. In all, there would be six novels, four children’s books, the two memoirs, and dozens of short stories — all throughout the years of raising her family. According to Elaine Showalter, “Jackson’s novels of the 1950s were all in the genre of female gothic, and dealt with themes of matrophobia, madness, lesbianism, and murderous rage.” Ushering the decade were Hangsaman (1951), the story of Natalie, a suicidal college student with psychic powers. 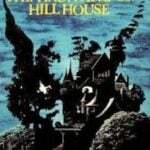 The Haunting of Hill House (1959) is one of Jackson’s best-known works, part ghost story, part psychological thriller. “One of the most terrifying aspects of publishing stories and books is the realization that they are going to be read, and read by strangers. I had never fully realized this before, although I had of course in my imagination dwelt lovingly upon the thought of the millions and millions of people who were going to be uplifted and enriched and delighted by the stories I wrote. 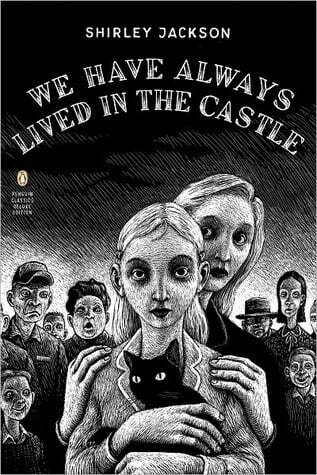 Jackson’s novel, We Have Always Lived in the Castle was made one of Time Magazine’s “Ten Best Novels” in 1961. She consistently intrigued readers with her thrilling tales. Many of her works have been adapted to film, theater, and television. 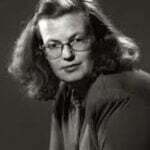 In 2007, the Shirley Jackson Awards were established with the blessing of the Jackson estate. 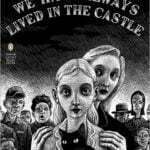 They recognize her legacy in literature, and in turn, give awards in the genres of horror and psychological suspense. 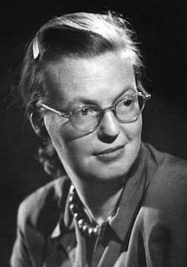 North Bennington, Vermont, the town where the Jackson-Hyman family lived, celebrates Shirley Jackson Day on June 27, the date when the story “The Lottery” takes place. Jackson was a heavy smoker, overweight, and, due to extreme anxiety, possibly addicted to unsafe prescription barbiturates. She also took amphetamines for weight loss, leading to a cycle of drug abuse. By the end of her life she was extremely agoraphobic, rarely leaving her house. She was only 48 when she died of heart failure in her sleep in 1965. In addition to these book-length works, Jackson wrote scores of short stories. Find her complete bibliography here.